Special Note: The Avalon Hybrid I drove was on loan from Wayne Mitchell, a dear friend and great guy. This review would not be possible if not for his generosity. Thanks, Wayne! The Avalon is an established car. Like all established cars, it has its own set of stereotypes and demographics. It’s Toyota’s largest, most nicely appointed, and highest priced car. These are the very things that cause most people to assume the target demographic is aged somewhere between 65 and dead. Toyota is aware of this stigma and reimagined the current generation of Avalon in order to attract younger buyers. Someone in their 50s, perhaps. Another interesting facet of the Avalon story is that it’s the car people buy when they don’t want to buy a Lexus. For multiple reasons, some people would rather have the Toyota nameplate than Lexus: perhaps they don’t want others to think they are trying to put on airs, perhaps they are concerned a Lexus would be a target for vandals, or maybe they just don’t like the overall feel of Lexus cars. Add to those personal factors the very tangible fact that the Avalon costs less than its ES Hybrid brother. First of all, I am not a large vehicle driver. When I first sat in the driver’s seat, I felt like a kid trying to wear his father’s shoes. The Avalon is a 195.3 inches long. That’s more than 16 feet! The free-throw line on a basketball court is 15 feet. Yes, I admit it: my own inexperience with large vehicles is what caused me so much uncertainty with the length of the Avalon. Let me say this, though: after a few days, I got accustomed to it and the overall size of the car never crossed my mind again. The side view of the Avalon is a study in elegant lines. Nothing too fancy or elaborate. Mostly straight lines extending from the front of the car to the rear. The slope of the roof backwards from its highest point is subtle and continuous creating a stubby truck door but also creating a huge rear window. Both of these provide excellent rear visibility. The front fascia is where Toyota added some excitement. Toyota has updated the grill with their now-standard large grill and vertical fog lights. The Toyota emblem is high in front, on a horizontal accent between the LED projection headlamps. This does two things: simplifies the front for a cleaner appearance and provides a more aggressive – dare I say manly – presence in a rearview mirror. Certainly, it might not be for everyone but it does show that Toyota wants younger buyers. Avalon uses Smart Key technology allowing the driver to keep the keys in their pocket or purse and interact with the car. One feature that is much appreciated is that the interior lights come on when the fob approaches. The nicest touch is that the lights do not blink on instantly but rather ramp up over the course of a couple seconds as the fob approaches and slowly dim when the fob moves away. It’s a subtle difference that makes a world of difference. Smart Key also allows the driver to unlock the doors by grasping the handle and lock the car by swiping the door handle from the outside. After using smart key to unlock the doors, owners will find it confusing when other cars don’t work the same way. I previously mentioned that the Avalon Hybrid was the brother of the Lexus ES300 Hybrid. Here is a breakdown of the numbers, just in case you aren’t convinced. The inch or two differences can easily be explained away with sheet metal bending, grill styling, etc. Toyota badges their hybrids high behind the front wheel. Lexus badges their hybrids low in front of the rear tire. The Avalon Hybrid, which is part Toyota and part Lexus, wears its hybrid badge low behind the front tire. It’s closest to the front tire like other Toyotas but low like Lexus. There is no way that is a coincidence. Many car enthusiasts will talk endlessly about how much they love their cars; the Avalon Hybrid is a car that takes the relationship to the next level and will love you back. The big comfy seats are a sheer joy to sit in. With six different seat control settings, if you can’t find a comfortable arrangement it’s not the car’s fault. Once that perfect seat position is identified, you can program it into the seat memory system. Not only will pressing the memory button return the seat to the preferred settings, the memory system can be linked to each of the two fobs so a couple can share the car in comfort. When climbing into the Avalon, the driver seat is back and low. This provides relatively unhindered access for the driver. When the car is started or the seat belt clicked, the seat adjusts automatically (either the last memory button pressed or the fob used). On the one hand, the way the seat assumes your perfect contour in a controlled glide is like being hugged. On the other hand, it is triggered by clicking the seatbelt, which means the belt tightens as you slide forward. Though the belt is allowed to extend with you, there were a few times when I felt it was necessary to readjust the belt after the seat stopped moving. It’s pretty trivial and after a while, I adjusted my routine to power on the car, let the seat adjust, and then fasten the seatbelt. No biggie. About the overall climate control, in my opinion, the best thing the driver can do is set it to AUTO and leave it alone. The Avalon never seemed to struggle when it came to maintaining temperature. This led me to believe that it was efficiently using the air conditioning system and being stingy with energy. Even when it was cold outside, the cabin warmed quickly. Adding to the cold day comfort are front heated seats. The driver and passenger have rheostat knobs with three stops to the right for heating and three to the left for cooling. If someone buys the Avalon hybrid over the conventional hybrid because they are concerned about fuel consumption, the heated seats certainly help in that area. By directly heating the body, there is less need to waste energy heating the cabin. The hybrid Avalon borrows parts from the conventional version, including the driver’s central dashboard setup of a digital information display planked by two analog dials. The most notable difference is that the tachometer of the conventional Avalon is replaced with a Power Meter dynamically indicating the flow of energy. The dial starts at what would be the 9:00 position on a clock. As the dial moves clockwise, the driver can gauge how hard to press the accelerator to remain in battery-only mode before the gasoline engine engages. If the driver exceeds the 12:00 position, the car is officially in “Power” mode. It’s when the dial is pointing between 8:00 and 9:00 that the driver knows energy from the tires or brakes is being recaptured and used to regenerate the hybrid battery. The message center, in the center of the dash, is a beautiful full-color display of system information and driver messages. Though the screen is relatively smallish, the graphics are well designed and rendered very nicely. Seriously. Above the message center is one of my hybrid annoyances: The [READY] light. That light is there to let the driver know that even if the engine is not running, the car is ready to be driven. I get that. However, once the driver has shifted into gear and started moving, why doesn’t the light go off? When on the interstate, I was continuously reminded – at 70 MPH – that they car was ready to drive. Really? Pop quiz: how many times have you looked all around the inside of a car trying to find the button that opens the trunk? Some manufacturers seem to enjoy a certain level of thrill in hiding the trunk button. The Avalon takes a completely different approach; the trunk button is clearly marked and easily within reach to the left of the steering wheel. That is a simple example of the little things Avalon gets right; there are no hidden buttons. Everything is easy to find. The steering wheel uses a simple design but packs a whole lot of functionality. Typical for Toyota vehicles, audio volume is controlled with the left thumb. Additionally, the left thumb controls the message center. The message center has multiple screens to flip through; a few provide the opportunity for interaction. With a 4-directional outer rocker and a central push-button, the Avalon allows the driver to quickly find the desired screen and perform any desired configuration. Once the driver gets the hang of the screens and buttons, it’s very intuitive. On the right side of the steering wheel are the phone controls: pick up an incoming call or hang up the current call. Additionally, the driver can invoke voice-activated commands with the press of the button. On the bottom of the right side is the button to enable/disable the dynamic radar cruise control, which will be covered later. 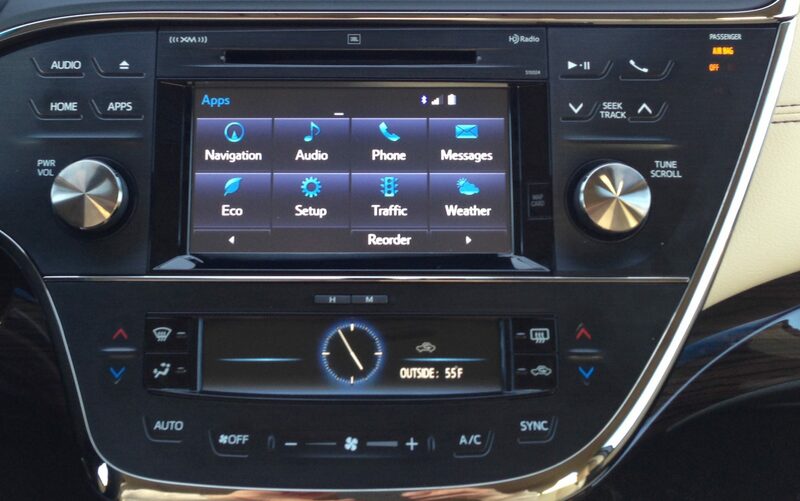 The infotainment center features a 6.1-inch multi-functional display. This screen is used to view navigation, control music, make phone calls, and display how the car is managing energy. If equipped, this screen also provides real-time weather and traffic. Toyota continues to promote its Entune suite of applications, including Bing Internet search, iHeartRAdio, MovieTickets.com, OpenTable, and Pandora. When enabled and connected to the Internet, the map screen provides real-time traffic information. Though the Avalon Hybrid doesn’t need fuel as often as the conventional version, when the time comes, it is surprisingly easy to look up nearby gas prices and station locations. When the best one is located, a single touch will provide navigation information straight to it. For my money, one of the best technologies introduced applied to a car’s central console is the capacitance button. I simply love the clean, smooth look of buttons that both are and aren’t there. Avalon‘s use of capacitance buttons creates a clean and smooth central console. The matching widths of the multi-function screen, CD slot, the climate screen, and the buttons below create a level of geometric symmetry that is so precise yet subtle that most people probably won’t even notice it. One of the hot tech additions to cars these days is the Qi charger, which will wirelessly charge Qi-compatible smartphones. By the way, it’s pronounced like “Chee”. In the Avalon, the Qi charger has a secret: it slides up to reveal a secret compartment. It’s not huge, mind you, but it’s got a USB port, cigarette charger, and the power button to the Qi charger. It’s large enough to hide a wallet and a few other little things that might be best left out of sight. Notice, in the following image, that there’s a slot in the bottom of the shelf; this way, even if your phone requires a cable to charge, you can feed it through and keep the cable mess tucked away. I love efficient uses of space and this little gem made me giddy. The Avalon Hybrid gets is power form a 2.5 liter 4 cylinder engine capable of producing 156 horsepower. It is coupled with a 105 kW electric motor. Combined, these two components can get the Avalon from 0 to 60 in about 8 seconds. Not too shabby for a car of such heft and comfort as the Avalon. The way Toyota has tuned the acceleration makes for the smoothest 0 – 60 acceleration I’ve ever experienced. It did not take long to figure out why the Avalon has blind spot monitoring. It’s because I literally could not see anything behind me to the right. Until I made the seat almost as tall as possible, I literally could not see anything. At 5-foot 9 inches, I felt tiny. When considering the entirety of driving the Avalon, that was the only negative I encountered. But when considering road safety, it’s a big one. The blind spot monitor became my best friend. The Avalon Hybrid has three different driving modes. These modes are used to adjust the ratio between pedal pressure and motor response. In Normal mode, there is a 1-to-1 ratio in that the car responds in concert with the amount of pressure applied to the pedal. When Eco mode is engaged, the dash takes a green hue and the amount of response to pedal pressure is reduced. In Power mode, the display is red and the response is increased. When in Power mode, the amount of “gitty up” is startling. For a large vehicle, it really has some spring in its step. In addition to these three modes, there is also EV mode, which forces the gas-powered engine to stay off and power the car exclusively from the hybrid battery. This mode is intended only for short distances such as shuffling cars in a driveway and should not be used as an attempt to improve overall fuel efficiency. Allow me to rant a little bit. If the driver moves the shifter all the way to the bottom, the car is in drive. Move the shifter to the left and now the driver has gear control and can shift up or down manually. To be clear, the Avalon Hybrid uses an electronically controlled Continuously Variable Transmission (eCVT). It uses software programming to continuously and instantly find the most efficient gear ratio for the situation. With a flip of the wrist, the driver can override that. Rather than write several paragraphs about how silly it is to electronically introduce fake gear settings to a CVT so the driver can play make-believe sports car driver, I’m just going to make it clear that I’m not a fan. I had to drive the car from Chicagoland to the North side of Milwaukee. It’s entirely interstate and this is where the Avalon really shines as a large, comfortable, cruising vehicle. As though the seats weren’t comfortable enough, as though the highway mileage was high enough, the icing on the cake was dynamic radar cruise control (DRCC). If you are unfamiliar, here’s a quick explanation: You know that 2-second gap you are supposed to leave between you and the car in front? At the press of a button, Avalon will use radar to dynamically maintain that gap for you. There are a few things to keep in mind, though. For one, there are really two things going on here. You set the speed you want to travel, say 70MPH. And you also set the distance from the car in front. Avalon will adjust to whichever is the slower of the two. This means if the car in font slows down then you slow down also but if the car speeds up to 75MPH you will not follow because Avalon will top out at 70MPH, where you set it. This way, you can set the upper speed limit you are comfortable with and know Avalon will never exceed it. One interesting twist is that if the car in front slows more than desired, just changed lanes. As soon as the Avalon realizes there is no longer a car in front, it will accelerate to the set speed. You will pass the slow car and continue on until catching another car and the DRCC kicks in, maintaining a safe distance. The Avalon is a top-notch family car. After so many iterations of the car, Toyota has nailed it down. The front seats are as comfortable as you will find in a sedan and the rear seats are equally as nice. Though you technically could seat three in the back, it would seem as though that’s not really the intent. Two very comfortable people can enjoy the back seat with an armrest between them. There is ample headroom all around, even in the rear, which is typically where cars fall short. To further increase the comfort of the back passengers, the Avalon has a rear window sunshade. With the press of a button, the driver can raise the sunshade. Showing that Toyota has thought of everything, when the car is shift into reverse, the sunshade automatically drops for rear visibility and raises up again when the cars shifts out of reverse. The trunk is an ample 14 cubic feet. This is a sizable trunk considering most manufacturers sacrifice trunk space for the hybrid battery. For example, the Honda Accord Hybrid’s trunk is 12.7 cubic feet and the Ford Fusion Hybrid is 12.0 cubic feet. That 14 cubic feet is large and spacious compared to the Fusion Hybrid trunk, which has odd shaped walls as they bends around the battery. It should be assumed that the purchaser of an Avalon Hybrid is interested in mileage. To facilitate this, when the car is turned off, the Message Center in front of the driver displays fuel economy information about the trip. In doing this, it allows the driver to compare today’s commute to yesterday’s, for example. The only downside with this display is that it seems to come and go much too quickly. The driver must be actively looking for it, and even then, a blink will miss it. Once the engine was warmed (which didn’t take long), the transmission transitioned from gasoline engine to electric motor seamlessly. Drivers of early hybrids reported rough shut-downs in which the engine would shudder or even kick when shutting down. This was never the case with the Avalon. Whether sitting at a stoplight or rolling down the street, the switch was always easy to miss. The EPA rating for the Avalon is 40 city / 39 highway / 40 combined. With a 17 gallon tank, around 680 miles per tank should be expected. I had the car for only 479.5 miles, not long enough to completely deplete the tank. The bulk of my driving was my regular workday commute; there was one day of interstate driving. When I gave the car back, it reported that there were 212 miles remaining to empty, which equates to 691. The Avalon reported my overall mileage at a respectable 43.5 MPG. This is a respectable 8.75% above the EPA estimate. However, Wayne filled the tank to his satisfaction and when he did the math by hand it calculated only 40.5 MPG. This is almost exactly at the EPA estimate. I cannot account for the variance other than to speculate that the onboard mileage calculator skews the results upward. In fact, searches online reveal this is not uncommon for cars that report their own mileage. 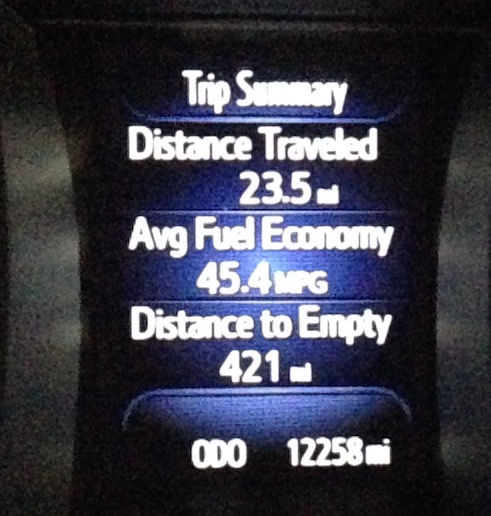 At the end of the day, the hybrid’s 40 MPG is substantially better than the conventional Avalon’s meek 24 MPG. The Avalon Hybrid has two primary actual ‘competitors’: the conventional Avalon and the Lexus ES Hybrid. Nearly doubling the Avalon’s fuel economy and priced $5,000 less than the Lexus are two very strong selling points. The Avalon does not fall into the “family sedan” true sense of the phrase in that no owner in their right mind would risk damaging the gorgeous leather with car seats and kids prone to throwing things best left outside the car. It’s not really a car you would see hauling kids to and from a muddy soccer field. The Avalon is a grown-ups’ car that adults will respect and enjoy, whether riding in the front or the back. The only kids riding in the back of an Avalon are home visiting from college. But the true question is: can the Avalon’s new styling, Sport mode, and advanced technology capture a younger crowd than its predecessors? That’s a tough sell. Given the overall size of the vehicle, it still feels like an older person’s large barge. Toyota will struggle to get younger buyers into actually trying the car to find out just how nice it is. This is a shame because it truly is a really nice car.